A 4 pair high performance cable that consists of 4 twisted pair conductors, used for data transmision. 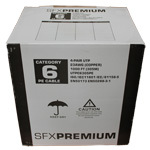 Cat5e supports a frequency range of 250Mhz and is designed for speeds upto 1 gigabit per second. Core Colours: Blue + Blue/White, Orange + Orange/White, Green + Green/White, Brown + Brown/White.